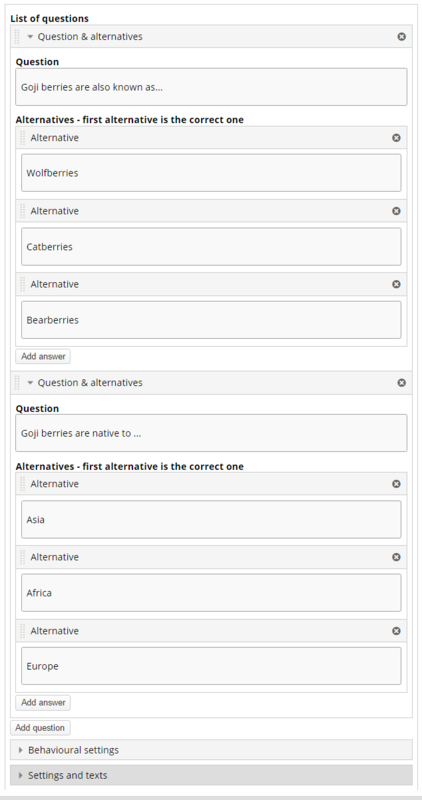 The Single Choice Set content type allows allows content designers to create question sets with one correct answer per question. 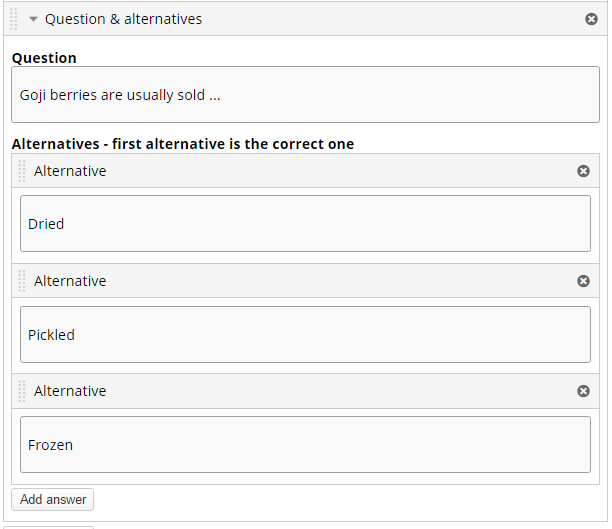 The end user gets immediate feedback after submitting each answer. Here's the Single Choice Set we'll create in this tutorial. Single Choice Set questions can be used for testing skills related to any topic, and can be an effective assessment tool. With immediate feedback and a summary at the end, user learning is reinforced. Single Choice Set features sound effects for correct and wrong (sound effects may be turned off). Single Choice Set questions can be used alone or integrated into other content types, such as Interactive Videos or Presentations. Either way, they are created in the same way. Navigate to the menu that enables you to create new content. You will now find Single Choice Set question in the Content type list when creating a new H5P. Let's say you want to create a Single Choice Set question about Goji berries. We'll create the test example from Examples and downloads page. In this tutorial we'll focus on creating the Single Choice Set question content. The content creation happens in the top part of the editor, so we'll only focus on this for now. 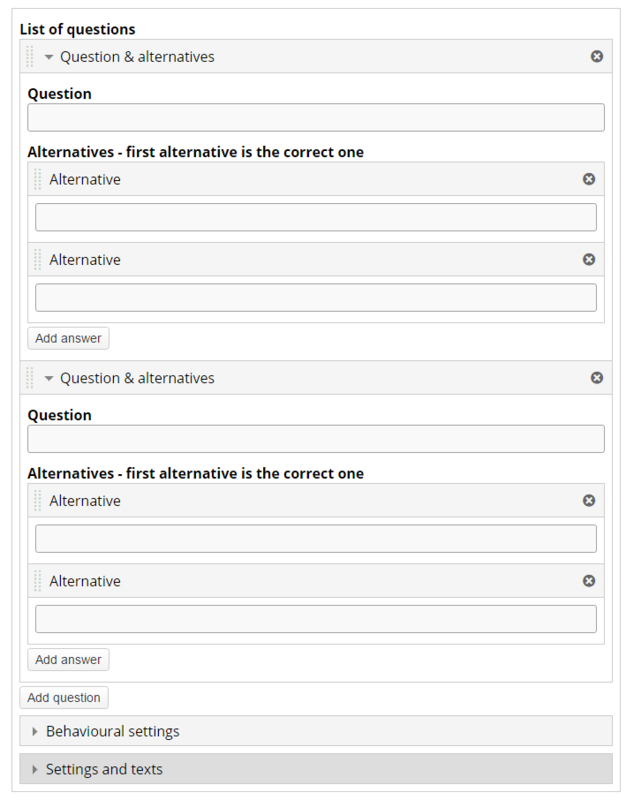 The Single Choice Set question content type consists of a question and a set of alternatives. The Question is used to introduce the problem to be solved, and the alternatives are the possible answers the learner can choose from. 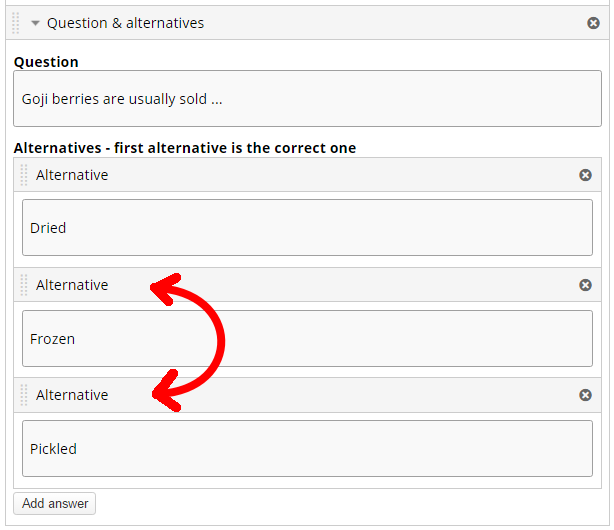 Write the first question under Question and enter the three alternatives under ‘Alternatives’. In order to create additional alternatives press the ‘Add answer’ button. The first (top) answering alternative is always the correct one. But don't worry, the answering alternatives will be randomized in the end user view. Also remember that you can only have one correct answering alternative for each question. Fill in the rest of the alternatives. You can add additional questions by clicking the ‘Add question’ button.Click 'add question' and fill in the newly added question with alternatives. button in the top left corner of the Question & Alternatives, drag and drop within the List of questions. button in the top right corner. Press Save/create when you are done! When setting up Adaptivity settings to show a message upon completion, they will not appear unless you ALSO place a timecode number in the "Seek to" box. So if you want a message to appear after the results (for either correct of incorrect answers) you will have to put in a dummy timecode in the "seek to" box or else the message will not appear. Be careful not to put a "seek to" time in the past for both correct and incorrect answers or else the user will be placed in a perpetual loop that they cannot get out of unless the press the video player's PLAY button (and not the "Continue" button). Also, this is nitpicky, but when you type in your message within the Adpativity message, be sure to add a dash and a space before your message because there is no punctuation after the default "You got # out of # correct" text. The adaptivity function is created for jumping to a certain place in the video on correct/wrong answer. I.e, enabling the adaptivity-function is done by adding a timecode to the seekTo field. I see how this can be confusing. It would probably be better if the adaptivity-feature needed to be enabled (a checkbox), which made the seekTo a mandatory field. Since I have done a few years of authoring on Articulate Storyline, I am accustomed to the ability to offer feedback contingent on the responses. The fact that this functionality in H5P is unbreakably tied to a "seek to" function is an encumbrance. I would prefer to have the two capabilities separate. There are fewer needs for a "jump to" function than there would be to offer feedback based on response results. Thank you for your suggestion, which I fully agree on. I have created an issue for this here: https://h5ptechnology.atlassian.net/browse/HFP-197. You may add comments to the issue if you'd like. Is it possible to have more than 4 alternatives per question? Yes, you can press the 'Add question' button at the bottom. How to add more than 4 alternatives for an Question? We should maybe change it so that it's possible to have more then 4. The limitation is defined in the semantics file. But for now, you can (if you are hosting your own site), add a PHP hook that changes that field in the semantics file, to allow for more answers. Just do it the same way as described in the documentation here. This is a pretty complex solution for a simple problem, but I'll talk to the core team, and we'll see if we should increase the max answer number for everyone. Oh that's why I can already see the quiz, good to hear that you figured it out. Thank you for reporting this. no, it does not work, i use another library multiple choice and i had to make another quiz, the single quiz 1.8.4 is not displayed does not seem to work. Sorry I misunderstood what you posted. Let me check on this again and get back to asap. When inserting the shortcode, have you typed it manually, or used the H5P button. You should try both. That's strange... I don't think this is related to a specific content type. Could it be another WordPress module is interfering with H5P? why not but it is just this h5p module, on any page, for example on https://www.frenchspanishonline.com/magazine/the-verb-to-miss-in-french/ Under QUIZ section I get [h5p id="13"] and it is not displayed either. I've searched in forums but I havent found any discussion on my subject. --> Is it possible not to show the correct answer and let the student try until he finds the correct answer by himself ? I want to add some HTML (like images) in the question section on every single choice. How can I change toolbar facilities and add "Insert/Edit Image" on Moodle? You need to make changes to the content's code. This documentation is a good place to start.